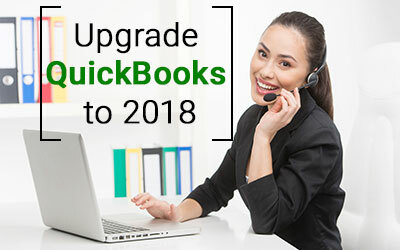 Would you like to upgrade your old QuickBooks to QuickBooks 2018? Really speaking, it is always greatly beneficial to upgrade the older version of QuickBooks to the new versions. With the changing requirements, the QuickBooks experts keep adding new and innovative features to enhance the user-experience. However, many of the QuickBooks users often find it difficult to upgrade older versions to the new versions of QuickBooks. Truly speaking, is not really a tough task. The QuickBooks experts have made this application so user-friendly that the users can upgrade it without undergoing any hassles. Download, install, and launch QuickBooks 2018. Select ‘File’ and ‘Open or Restore Company’. Browse to the data file then click ‘Open’. Go through the information in ‘Update Company File for New Version’ pane. Check the box to indicate that you understand the information, and then press ‘Update’. See the instruction and accordingly back up the file. Note the location you place the file. Once you update, the data file will be updated. However, you should store the backup. You may require it in the future. Once you are certain that you no longer require the backup, you can delete it or let it be where it is. In case you copied the file from any other computer system, copy it back again and keep it there. If the file is not visible or available in its original location or folder, you can search for *.qbw files in the hard drive. While searching, you need to include hidden files and folders in the search criteria. Though this is not quite a difficult process, the amateur QuickBooks users may find it a bit confusing. However, there is no need to panic. The QuickBooks users can access the QuickBooks support professionals as and when they face any QuickBooks issues and fail to resolve them using the troubleshooting methods.